Prior to the invention of the modern hot tub as we know it, people have enjoyed soaking in hot water for thousands of years. People have used hot springs as areas to relax and to socialize. From the ancient Egyptians to Japanese people to Native Americans, people from all over the world have taken advantage of the restorative powers of hot water. Even today, we love ending the day with a nice long soak in the tub, releasing the stress of the day. 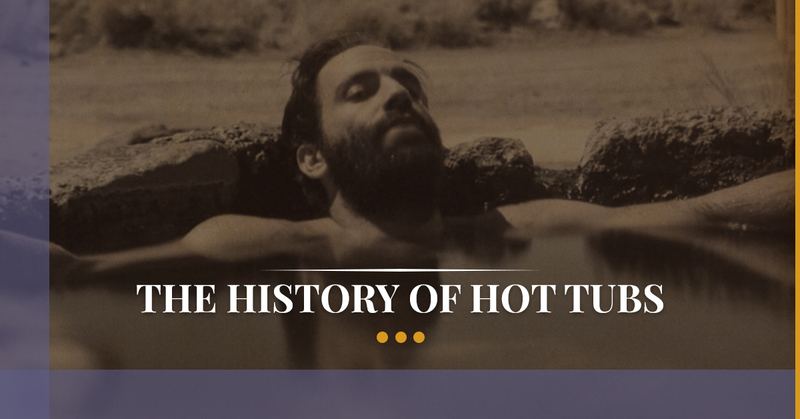 Today we would like to discuss the history behind hot tubs. As early as 2000 BCE, Egyptians embraced hot baths as a part of their daily routine. In fact, some Egyptians bathed up to four times a day, taking personal cleanliness to an entirely new level. Wealthier Egyptians had bathing rooms built into their homes and would often add flower petals and essential oils to their bath water for an added sensory touch. At the time, most Egyptians didn’t bathe inside the home but instead washed in the Nile River. In ancient Greece, volcanic springs featured warm water rich in minerals that were good for both the body and the mind. Naturally, the Greeks built pools surrounding these springs for bathing and laundering clothes. Over time, their pools evolved into more elegant locations designed for entertainment as well. Although aqueducts were available to ancient Greeks, the Romans took the construction and engineering of these structures to the next level. Not only were these massive structures beautiful, but they supplied water to towns for both private and public use. As a result, elaborate bathhouses emerged, complete with heated floors, walls, and boiler rooms. Bathhouses also became a gathering place for social and recreational activity and often even included reading rooms and perfume booths. Since 759 CE or even earlier, Japanese people enjoyed soaking in pools built around volcanic springs. With several highly active volcanic islands, Japan includes plenty of amazing hot springs that are still utilized in modern times. Unlike other ancient cultures, Japanese built ofuro, which were wooden soaking tubs, for meditation and relaxation. Before soaking in an ofuro, which would only hold one person at a time, the person had to bathe so that someone could use the tub after him or her. Traditionally, the oldest members of the family bathed first so that the next person could absorb their wisdom through the water. Located in Saratoga, NY, the High Rock Spring was utilized by the Mahican tribe for thousands of years. Renowned for its healing powers, the Mahicans referred to the “Medicine Spring of the Great Spirit.” When British veteran of the French and Indian War, Sir William Johnson, was suffering from old wounds from the war, the Mohawks placed him in this spring to provide some relief. In Arkansas, several different Native American tribes gathered together in peace at a hot spring known as the “Valley of the Vapors.” Eventually, white people took over the site and established a settlement, now known as Hot Spring. During the Prohibition Era, this town would become a favorite hideout/vacation spot for gangsters, including Al Capone , Bugs Moran, and Lucky Luciano. Gaining massive popularity as vacation areas for rest and relaxation, resort spas emerged all across the US and Europe. One of the most famous of these resorts was owned by US President Franklin Delano Roosevelt, who suffered from polio. The warm springs helped improve the condition of his muscles, which were damaged from his then-incurable disease. Roosevelt absolutely loved escaping to this resort, where he died in 1945. When American soldiers encountered Japanese culture during World War II, they adopted their enemy’s practice of bathing in ofuro tubs. However, no such invention was available in the US, so people began building their own unique take of ofuros. Often, winery barrels and other wooden tubs were used to build hot tubs, which were heated with wood-fired heaters. Unfortunately, homemade wooden spas were rife with issues, containing high levels of bacteria, mold, and algae. Also prone to leaking, these early-American hot tubs were not really working out well for anyone. In the late sixties, fiberglass models replaced wooden tubs, but the material often blistered or stained. By replacing fiberglass tubs with acrylic tubs, hot tubs gained immense popularity in the 1970s, especially after jets were introduced. As cost materials dropped and spas became easier to install, the number of hot tubs in American homes continued to skyrocket. During the 1980s and 1990s, hot tub designs evolved so that they were easier to maintain and they featured more jets. It’s clear throughout history that people from all walks of life enjoy soaking in a hot tub. Why not enjoy the benefits yourself by purchasing a hot tub spa at our spa store in Maple Shade? Spa Hearth & Home features a wide variety of spas, pools, and outdoor patio furniture. Transform your backyard into paradise by contacting our outdoor furniture store today.